The Russian Defense Ministry has released breathtaking footage of S-300 anti-aircraft systems launching missiles during Vostok 2018 exercise. Other stunning highlights from the drills were also caught on camera. 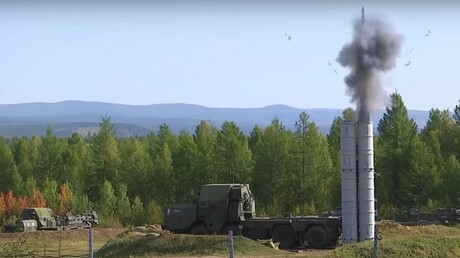 The spectacular video shows S-300s preparing to fire missiles at an undisclosed location during the Russian military’s Vostok 2018 wargames which run until September 17. The missiles are seen launching from their silos and traversing the skies over the woods. Accompanied by Buk-M1 medium-range air defense systems, the S-300s then quickly leave their firing positions and move to another spot. Aside from this footage, the Defense Ministry also unveiled an array of other videos allowing you to get a grasp of the exercise, said to be the biggest in over three decades. Another video shows a battery of Iskander tactical missiles being launched from a training range. Russian airborne troops also showed off their capabilities during Vostok 2018. This video shows soldiers fast-roping from Mi-17 helicopters and parachuting from Ilyushin Il-76 Candid transport planes. Warships also had a say on the naval theater, protecting the coastline from a mock adversary. On Thursday, tanks, heavy artillery, missile systems and combat jets took part in the impressive display of military might as they marched through the Russian Army’s Tsugol training range. The array of military hardware gave a glimpse into the true scale of the Vostok 2018 drills, which have already been called the largest such exercises since the 1980s.